Identification: Body is black with a white band across the abdomen. Forewing upperside is gray-brown; median area has black lines and a gray band; underside is white with a black outer margin. 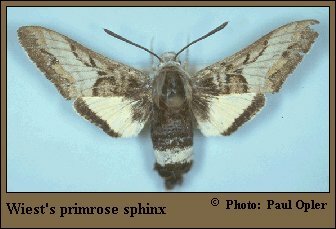 Hindwing upperside is yellowish white with a narrow black outer margin and black at the base; underside is white with black at the base and a black marginal band. Life History: Adults fly during the day. Females lay eggs singly at the base of host leaves; eggs hatch in 7-10 days. Fully-grown caterpillars pupate and overwinter in underground cells. Flight: . One brood from May-June. Caterpillar Hosts: Prairie primrose (Oenothera latifolia) in the evening primrose family (Onagraceae). Habitat: Sand washes and blow-outs in prairies. Range: Northeast Colorado south to northern New Mexico, west to southern Utah and northern Arizona. Management Needs: Monitor grazing effects on habitat and minimize spraying on known populations.